The D-Wave 2X quantum computer at NASA's Advanced Supercomputing facility in Silicon Valley is an impressive machine. Engineers from NASA and Google are using it to research a whole new area of computing -- one that's years from commercialization but could revolutionize the way computers solve complex problems. The machine is also being used by researchers at universities, and it's hooked up to the Internet, like other NASA supercomputers made available to academics. Engineers who showed the machine to the media on Tuesday were keen to talk about its capabilities, but less so about the security measures in place to stop hackers. "It's behind various security firewalls, with RSA security tokens to get in," said David Bell, a director at the Universities Space Research Association, in response to a question. "We are very much aware of systems being hacked," said Rupak Biswas, who heads exploration technology at the NASA Ames Research Center, in response to another question. "NASA, of course, is a major target." Biswas said he didn't want to get into specifics, beyond explaining that there are "very strict processes as to how and who can get onto these systems." 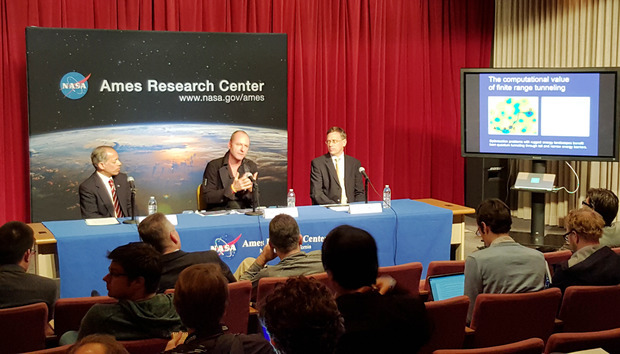 The line of questioning was quickly shut down by a NASA moderator, who said the topic was "for later discussion at another time." Here's video of the reply.